It's been a rough couple of years for Newell Brands investors, but today's bottom-line beat was enough to provide a temporary boost to its battered stock price. Shares of Newell Brands (NASDAQ:NWL), a leading global consumer goods company with brands that include Coleman, Jostens, Paper Mate, Sharpie, Rubbermaid, among many others, are bouncing 14% higher as of 12:00 p.m. EDT Friday after better-than-expected third-quarter results. The company's third-quarter revenue actually fell short of analysts' estimates, falling 10.9% to $2.28 billion. However, its adjusted earnings per share checked in at $0.81, which was well ahead of estimates calling for $0.65 per share. The strong quarter enabled management to boost its full-year 2018 adjusted earnings-per-share guidance from a range of $2.45 to $2.65 up to $2.55 to $2.75 per share, while maintaining its sales guidance of $8.7 billion to $9.0 billion. "Our third quarter results reflect solid progress in a number of areas as we continue to execute the Accelerated Transformation Plan announced in January of this year," said Michael Polk, president and CEO of Newell Brands, in a press release. "Our focus on margins and operating cash flow has begun to pay off as we generated strong sequential improvement on both metrics resulting from organization restructuring and diligent cost and working capital management." 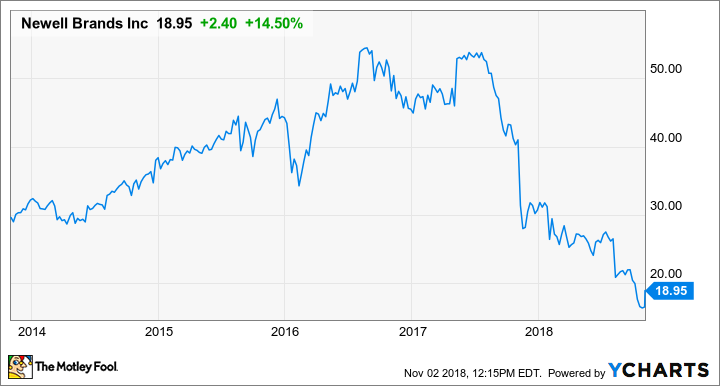 Despite today's 14% pop, the company still has much work to do, as you can see by the dismal stock-price performance since the beginning of 2017. Going forward, it will continue focusing on its "Accelerated Transformation Plan," which is based on divesting noncore businesses, improving operations, and deleveraging the balance sheet. The company has made some progress closing three transactions -- the Waddington Group, Rawlings Sporting Goods Company, and Goody Products -- and lowering its net debt position by $2.5 billion, compared to the prior year. While there's much work left to be done, today's better-than-expected bottom-line beat was easily enough to send its battered stock price higher.